Are you looking for a way to teach your students how to ace the Texas STAAR 10th grade English writing test? I have developed a rubric with very specific requirements. It is easy to use and to grade. On the final copy, I have students label all the rhetorical devices they used in their essay. I always tell them, the more rhetorical devices you use, the better the grade. I have also included a 4 page peer editing document that can be done through the clocking method. Students can sit in a circle and each student focuses on a different aspect of the paper. There are 11 opportunities for peer editing from checking the thesis, rhetorical devices, and grammar. Also, I have an expository rubric and peer editing page for sale on TPT as well. 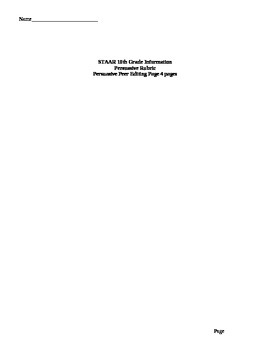 For $4.50, you can get the STAAR persuasive and expository rubrics and peer editing pages.